In ASP.Net, "Page-Level ViewState" plays an important role when page “post-back” happens for multiple times (More than one time). When data filled in a Web Form go to the server and returns back to the same browser session, we can call that as “Post-Back”. In this example, we are going to experiment how web server preserves the form data and learn the ViewState form-level property. Here, the user will input the data in the “Product Name” and “Quantity” text boxes. When the user clicks the Add button, the data is posted to the server and server sends back the response to the same page. The Label at the bottom of the page is populated by the server before sending the response (Post-Back) back to the browser session. What is the role of ViewState in PostBack? How form level data is preserved and what is a hidden field? 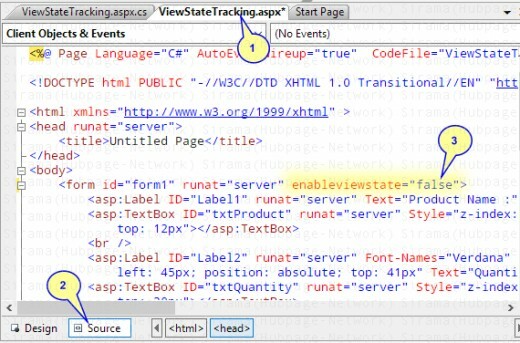 Design the Form in ViewStateTracking.Aspx page as per the Previous section. The handler code concatenates the Product (Marked as 2) and its Quantity (Marked as 3) from the corresponding TextBoxes and assigns that to the Label Control (Marked as 1). Note the usage of "Line Break" (Marked as 4) at the end of the string addition. This is to show each product on different line. Compile and build the code and then view the page in a browser (Right Click the Page and choose “View in Browser” from the Context Menu). Once the Page is opened in the Browser, the initial page looks like what is shown in the top-left corner of the screenshot below.
. After filling the form field data (Product and Quantity), we hit the “Add” button and data is posted to the Server. We call this as First Post-back (In the depiction below, it is shown as Data Post 01). which is given in Section 3 of this Article (For Example, Default for Label1 is “Product Name:” and Default for lblListOfProducts is <blank>). After Applying the defaults, Server overrides the defaults with the data received from the client browser. After that, it fires and handles the event triggers. In our case, the server runs the btnAdd_Click handler. Note that the button is clicked on the Browser and handler runs on the server. By the time Button click handler runs on the server, the defaults are already got replaced by the user filled Form Field Data for Product Name and Quantity. The handler performs string concatenation and post-backs the data back to the browser. The Browser renders the lblListOfProduct with “Product No 1232-15” along with other Form Field Data which is not changed on the server. As part of Data Post 02, we are entering Product Name as Product No 3215 and Quantity as 22 and Hit the Add button. We are doing this in the same browser session after postback happened. The Form Field Data filled by the user is posted to the server. Does Data Post 02 posts the Label Content “Product No 1232-15” to Server? The answer is No as it is not filled by the User and moreover it is rendered by the Server which is part of Previous Post-back. Now, when data received by the Server (Altogether a new post), it doesn’t remember the Label Text from the previous Post (Data Post 01) and thereby ends-up rendering “Product No 3215-22” in the lblListOfProducts. This is not the behavior we need for that Label, Right? 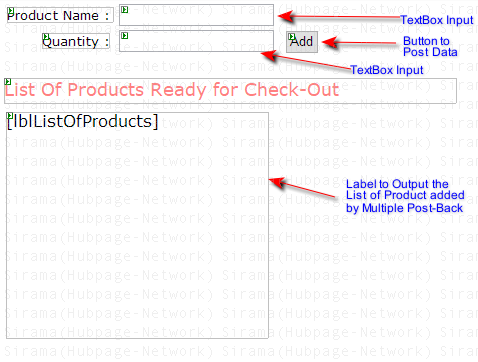 We want to display products gets piled-up on each Add click thereby showing check-out list for the User. In the previous section, we saw the need for ViewState by consecutively posting the Data to the Web Server. Now turn ON the ViewState property by setting the “EnableViewState” to True. Refer the picture in Section 3. Now, look at the Picture below. Here, we have done same three post-back like we did before. But, in the Picture, we have taken only two for our analysis. When we browse our example page, we are making an “Http Get” request as we are requesting the web page from the server. This action is initiated by the client browser which is requesting the page from the Web Server. The user at the client browser fills the form field data (Two Text boxes) and clicks the Add button and this makes an “Http Post” and in the picture, it is shown as Post 01. The Web Server responds to the Add Click Event and calls the C-Sharp Event Handler for the Button Click Event. In the Button Click Event, we are forming the content for our lblListOfProducts Label. Now, as EnableViewState is turned ON, the Web Server packs the “Page Level View State” information as Hidden Form Field Data and performs the Post-Back. In the Picture, it is shown as Post-Back 01. Here, view state information is nothing but the data-posted back by the server to the client browser (Shown in Yellow). 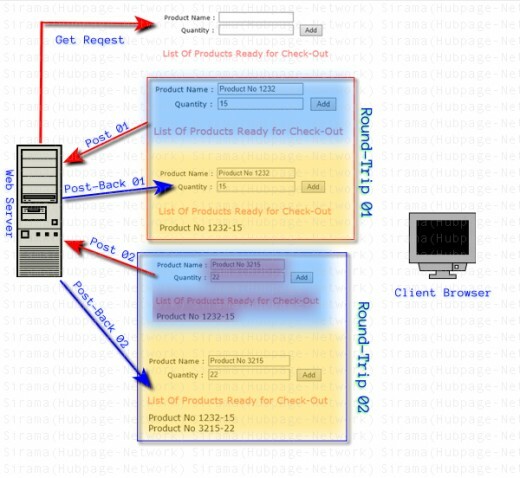 We call this as Round-Trip which is nothing but data flow from Client => Server => Client. In the Picture, it is Marked as Round-Trip 01. Once Round-Trip is over Web Server doesn’t remember anything about Post 01. Now, the user at Client Browser, Fills the Form field data and clicks the Add button, this initiates the second Http Post which shown as Post 02 in the picture. This time, the Web Server receives the Data Filled by the user as well as Hidden Form Field data packed by the Server as part of previous Post-Back (In our Example it is Post-Back 01). 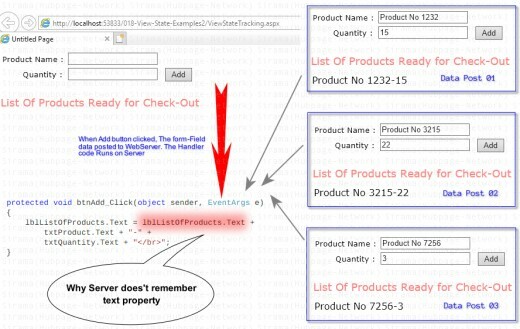 Once the data received by the server, Event Handler can see the previous postback content of the lblListOfProducts. Because of this, string concatenation goes well in the Event Handler. After forming lblListOfProducts' text, just like previous post back, the Server re-forms the View State information (With PostBack 02 information as it is required if Post 03 in-bounds) and performs the Post-Back 02. Now Client Browser that is we can see both the products in the check-out list. Hope this Article explained the role of ViewState between Page Posts and PostBacks. Thank You.